When shall we bind fast the Gray Dragon ? which their pathway lay open to travel into Shaanxi or Ningxia. final destiny right after the Battle of Kharakoto, the Tangut Capital in the Hei River delta, in the year 1227 AD. Although the Tanguts were finally defeated at the Battle, so was Genghis, who according to legend limped away with Battle wounds, never to Rise up in Anger again. Although most historians today do not believe the Legend of Liupan, the Grave-Site or rumored 'lavish tomb' of the Great Khan Genghis has never been located and is still being sought today. Most archeologists and historians believe the Tomb must be hidden somewhere in Inner- or Outer-Mongolia, however there may be some truth to the Liupan Mountain-story. That is: It is true that during the Time of Genghis final demise, the Liupan Mountain area consisted of an isolated valley full of medicinal plants. (Some internet sources even claim that Genghis Khan had his summer quarters in the district of Qingshui south of the Liupan Shan (Liupan Mountains) in Gansu, China. However, this seems unlikely since Genghis Khan was a General who was always on the move with his Army. He had been campaigning since 1216 AD at least, capturing Balkh in Afghanistan and defeating Sultan Jalal al-Din’s on the Indus River banks in 1221 AD. Thus the notion of a summer residence seems far fetched). Furthermore, Liupan Mountain lies only some two hundred kilometers away from the borders of the Xi Xia Empire -thus within safe territory. On the other hand, protected by the barier of the Mountain, at Luipan the Great Khan and his Armies were at only a 150 kilometers from both Jin and Song Dynasty territories (in Shaanxi Province), which put them in a brilliant strategic position in case the Great Khan recovered and wished to carry forth his conquest against the next enemy state, that of the Han Chinese (Jin in the North and Song in the South). History did not allow Genghis Khan to live beyond his Victory over the Tanguts (XiXia) and no traces have been found (and reported) of the ancient Nomadic Army today. There is a modern ‘Chinggis Khan Camp’ on the mountain with with concrete gers and stool-sized cylinders of stone, the latter of which may date back to the year 1227 AD. Although there is no trace to be found, no one has yet found the Tomb of Genghis either, and thus it may lie hidden somewhere very close-by. Visit the Temple at the Top which in ancient Times could only be reached by following the winding paths up the mountain, or head to the local 'Long March' memorial and Tourist Souvenir Kiosk. You Tube Clip: Rediscover China-Yinchuan, Ningxia. The Ningxia Hui Autonomous Region (Pinyin: Níngxià Huízú Zìzhìqu, simplified Chinese: 宁夏回族自治区) is known throughout China for its spectacular green valley's among the Deserts. The Regional Capital City Yinchuan is often cited as one of China’s Top Ten Cities of because of its tranquility and good quality of Life. Apart from this Ningxia possesses a great number of historic sites, among which the Tombs of the Kings Early Western Xia (Xixia or Tangut) Empire are found the most attractive. The most prominent of these famous Tombs are located at two seperate locations at a distance of some 30 kilometers west of Yinchuan, however in fact the remnants of nine Western Xia emperors' tombs and two hundred other tombs lie within a 50-km area around Yinchuan giving plenty of archeological sites to visit. Head out to the West to find the main sites known as the 'Western Xia Tombs' and the nearby Twin Pagoda's of Baisikou or Baisikou Shuangta. Yinchuan City itself knows two Pagoda's, as well as several Mosques and an interesting 'Old City' District. Ningxia Autonomous Region is home to 1 National Park; the Xixia Wangling National Park. Apart from this Ningxia counts 5 National Nature Reserves: Helanshan National Nature Reserve, Liupanshan National Nature Reserve, Shapotou National Nature Reserve, Lingwu Baijitan National Nature Reserve , Luoshan National Nature Reserve and Habahu National Nature Reserve and 5 National Forest Parks. The National Forests Parks are: Suyukou National Forest Park, Liupanshan National Forest Park, Huamasi National Forest Park, Huoshizhai National Forest Park. and Lingwu National Geological park. There are no state protected wetlands in Ningxia regardless of its importance for migratory birds and other species. The One national urban wetland park in Ningxia is the Baohu National Urban Wetland Park, at Yinchuan. In addition there are 5 National Water Parks of China falling under the National Ministry of Water Resources. These are Qingtongxia Tanglaizha Scenic Area, Shapotou Water Park, Aiyihe Water Park in Yinchuan and Xinghaihu Water Park near Shizuishan. 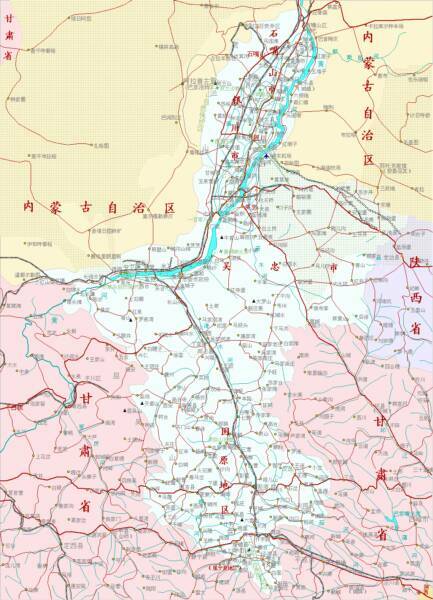 As a last item there are two National Aquatic Germplasm Resources Conservation Area's in Ningxia, the first one Silurus lanzhouensis National Aquatic Germplasm Resources Conservation Area at Zhongwei-Zhongning Section of Yellow River, and the second Rhinogobio nasutus National Aquatic Germplasm Resources Conservation Area at Qingtongxia-Shizuishan Section of the Yellow River. the South- West. The northern wall in Dawukou District of Shizuishan Prefecture, which includes the very short Juicaigou Great Wall section is the least visited section. Lesser known but of Great Archeological and historical value are the Beidachi Great Wall remnants near Subujing due North-West of Yanchi with ancient sections dating to early Dynasties, and the nearly lost and forgotten Great Wall at Sikong, which lies abandoned and overblown by sand north out of Sikong in the Tengger Desert. A last historically location is the Great Wall at Guyuan, which consists of an Inner-Layer of the complicated Defenses in this region. The earliest Great Wall sections around Guyuan date from the Qin Dynasty (221 BC - 207 BC). Even more Great Wall of China remnants can be found along the Gorges of the Yellow River. The Ningxia Provincial Museum, which was opened in 1988, is no longer housed inside the Old Chentian Si Temple of Yinchuan but has moved to new and modern facility nearby. The Museum contains unique relics from the Western Xia (Xi Xia or Tangut) Empire and the Northern Zhou Dynasty, as well as recent archeological finds from various sites within the wider Region, as well as many items specific to the local Hui Ethnic History and Culture. Interestingly, the rich history of ethnic uprisings in Ningxia is far less advertized. Read and see more in Landmarks in Monuments of Yinchuan City. Others are thought to have been carved as late as the Western Xia (Tangut) Kingdom and Yuan Dynasty (1271 AD - 1368 AD). emerges from its wild and boiling path through the steep Gorges of the Loess Plateux in Gansu Province. To be exact, there are 20 steep and narrow gorges in the Yellow River sections in Gansu Province. Together with the Longyang Gorge, Jishi Gorge, Liujia Gorge and Bapan Gorge, which lie more upstream, the Qingtong Gorge ranks among the most famous and notorious. 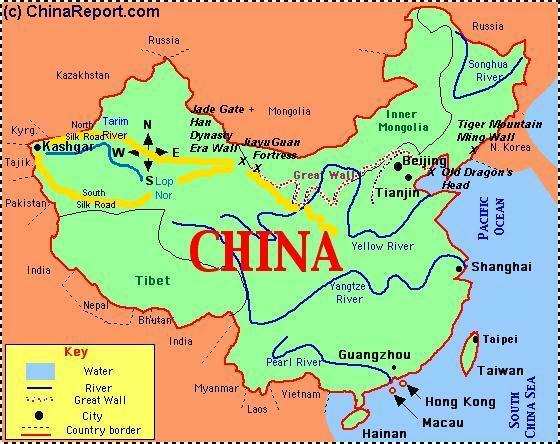 Due to large differences in elevation the flow of the yellow river in these sections is traditionally especially rapid, thus in the past making it in-navigable except for perhaps the most skilled boatsmen. Yellow River snaking through the Loess Plateux in North-Eastern Gansu Province. Find the Zhongwei Great Wall located near Xinxing Town of Zhongwei County at about 30 kilometers distance from Zhongwei City Center. Between Shapotou and Yinchuan the regions along the river are mostly deserts and grasslands, with very few tributaries. The river widens and its flow turns to a very slow pace. 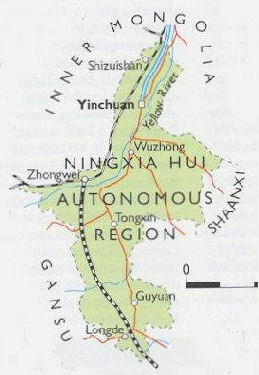 The Hetao Plain has a length of 900 km (560 miles) and width of 30 to 50 km (20–30 miles). It is historically the most important irrigation plain along the Yellow River and holds three of the four major cities of the Region. Hence, the first dam to be constructed on the Yellow River was the Xintongxia Dam. Since 1968 AD at least 6 more major dams have been constructed along the Yellow River, the largest of which is the Xiaolangdi Dam, China's 2nd largest hydro-electric project. 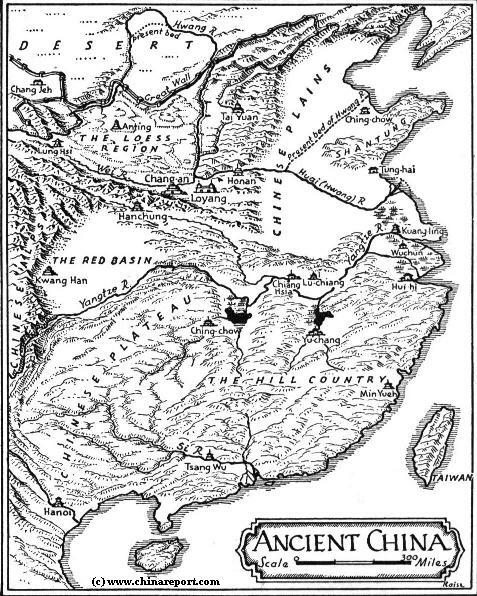 An Old schematic Map featurig China's main geographic landmarks and main monument:The Great Wall of China. scenic location of the Great Wall of China. Although recently reduced to mere ruins in the Tengger Desert sands, the Great Wall of China at Zhongwei is nationally famous as the spot for one of the best views to be had from the Great Wall. road eurasian trade-routes. This new museum, the Ningxia Transportation Museum is located near Yinchuan and includes 10 exhibiting sections, presents the transportation development and achievement both in history and mordern times in Ningxia. Much emphasis is placed on historic modes of transportation, such as was used during the two millenia of the history of the Silk Road. On display are many replica's of Zhou, Qin and Han Dynasty (206 BC - 221 AD) Battle wagons, Chariots and Oxen Carts, Original specimens and replica's of archeological discoveries depicting ancient modes of transport abound in this interesting Museum. Other sections pay attention to modern Chinese Development and the importance of the opening of the Baotou-Lanzhou Railway line which, since its opening in 1958 AD, has helped transform life in Ningxia. The Twin Pagoda's of Baisikou are the first site to be reached from Yinchuan, situated in the foothils of the Helan Shan mountain range and nearby the ancient mountain pass village of Gunzhongkou. Small mountain paths wind their way in all directions from the Town, one leading North towards the Twin Pagoda's. Both Pagoda's are built in Stone and survive from the 11Th Century and the earliest years of the Empire of the Tangut People, known in China as the Xi Xia or Western Xia. In entire China (P.R.C.) only 4 such Pagoda's remain, of which these make up half. Topping 13 and 14 storey's in height the pagoda's dominate the surrounding Green Landscape and both architecture and surroundings make for a must see and visit place in Ningxia. Just South of Town of Gunzhongkou is the other attraction, the so called 'Western Xia Tombs' or XiXia Wangling. There are a variety of ruins and Tombs among which the Tomb of Li Yuanhao, the founder of the Western Xia 'Dynasty'. Each of the tombs is a complete and more or less preserved architectural complex. The halls above the ground are mostly destroyed and ruined in ruins however the mourning platforms and sacred walls remain largely intact. Baisikou once served as the summer resort of Emperor Li Yuanhao of the Western Xia Dynasty that lasted 190 years, saw 10 Emperors and had its own oral and written language and a strong army. The XiXia Army eventually died at the hands of the Mongols but they likely took the infamous Mongol Leader the Great Genghis Khan himself with it, as he died shortly after defeating the Tangut's by capturing their second Capital at Kharakoto (Heicheng). Last but certainly not least must be noted the Xumi Shan (Treasure Mountain) Buddhist Caves and Holy Mountain, with a rich history directly linked to the ancient Silk Road and the Rise of Buddhism in Eastern Asia. The Xumi Shan are another location of Buddhist Cave Complexes found along the pathway of the ancient Silk Road, the main pathway of which led directly along the Qingshui River Valley to the Guyuan Area. In this case there are no less than 8 clusters of Buddhist Statues and some remaining Cave Art spread out for more than 1.6 kilometers along a River Bank. Statues and Art date from the 5Th and 6Th Centuries AD (Northern Wei Dynasty (386 AD - 534 AD), Sui Dynasty (581 AD - 618 AD) and Tang Dynasty (618 AD - 907 AD) with the jewel of the complex being a 19 meter (65 Foot) high seated Matreiya (Future Buddha) Statue. Although the Xumi Shan Grottoes are by far not the best preserved historic caves in China, they are the only such complex found within the Ningxia Autonomous Region. Especially for those who have never visited such a site before it is a worthwhile trip. To find the Xumi Shan Caves, travel some 460 kilometers from Yinchuan to Guyuan City, which lies along the Qingshui River in the extreme southern-tip of the Ningxia Region. At a distance of some 50 kilometers North-West from Guyuan, the Caves can be found outside of Huangduobao Village in the vicinity of Sanying Town. No regular tourist busses travel to the Caves, so arrange for a certain arrival before traveling out on the mountain to the caves. Easiest way to get there is to take a taxi or a minivan from Guyuan to Xumishan which takes about an hour. Mind you, this is a notorious earthquake prone area, so:in theory anything may happen. When you have the opportunity to stay in the area longer, try and find the new Guyuan County Museum (固原博物馆).The museum is an imposing ancient building complex with an area of 28,000 square meters. It has four exhibition halls, with a collection of 10,000 relics, including articles unearthed from the tombs of the Western Zhou, the Northern Wei (386 AD - 534 AD), the Northern Zhou, the Sui Dynasty (581 AD - 618 AD), and the Tang Dynasty (618 AD - 907 AD), the stone and jade ware from the Old Stone Age, painted pottery of the late stone age Yangshao Culture, original copper swords of the Spring and Autumn - and the Warring States periods, a large collection of porcelain ware of the past dynasties, a rare example of a trigger mechanism dating of the Warring States period, a tri-pod of the Qin Dynasty (221 B.C. - 207 B.C. ), ancient coins and even more. All objects on display were chosen to represent the Silk Road culture of the Northern Zhou time. Although Shapotou is hailed as a scenic zone, it is actually an ecological disaster zone. At this research center the Zhongwei Sand Harnessing Center of the Lanzhou Research Institute of Desertification works to find methods to battle desertification and other local environmental woes. The Center was established in 1956 AD. Since its 2004 AD recognition by the United Nations as an important model facility for anti-erosion and anti-desertification methods invented and tried at Shapotou have been copied throughout the world, a fact of which local authorities are quite proud. Today it is a steady part of the tourist itenerary, especially for Chinese. Before Zhenbeibu was a dusty and completely remote spot only worthwhile to visit for its collection of ruined old fortresses, one built in the Ming Dynasty Era (1368 AD - 1644 AD), the other later during the Qing dynasty (1644 AD - 1911 AD). Hardly anyone visited, mainly those interested in the remote corners of the defenses of the -now ancient- Great Wall of China in Ningxia Region. However, much has changed since the Town's famous ruinous 'Moon Gate' featured in a mainstream Chinese Film. Ever since, a steady stream of Actors, Film-makers and later tourists and romantic couples have made their way out to these remote corners to share in the purity and simplicity of life in the small village. In 1992 AD the brand-new West China Film Studio was founded on the Zhenbeibu site after which the barren desert landscapes of Zhenbeibu Town and surrounding area's have featured as dramatic backdrop in over 60 Chinese Films. And the work is not yet done as the Chinese Public has fallen in Love with Ningxia's landscapes and sceneries. Although the West China Film Studios are still very much operational, the Site of the Studio has been exploited as a Tourist Destination and attraction for several years. Especially during the holiday seasons, business is booming. 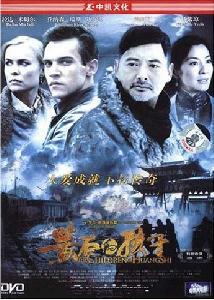 For anyone not in love with Chinese Cinema, it is probably a horrible and not very interesting place to visit. Lovers of Chinese Cinema however, especially those who enjoyed: 'Red Sorghum' (Zhang Yimou), 'Ashes of Time' (director Kar Wai Wong), 'A Chinese Odyssey Part One: Pandora's Box' (starring Stephen Chow) and 'A Chinese Odyssey Part Two – Cinderella' (starring Stephen Chow), must visit and have their Photo taken at the by now internationally renowned 'Moon Gate'. To be entirely complete: don't forget to visit the modern day Nanguan Mosque, the historic Haibao Ta Buddhist Monastery and Dagoba Tower in Yinchuan, Suyukou Forest Park at Helan Mountain, Wu Dang Miao near Shizuishan and Liupan Shan on the extreme southern border with Gansu Province. A true jewel of islamic History and Architecture in Ningxia Hui Autonomous Region is the Najiahu Mosque, located due South of (Old) Yinchuan City within Yongning County. The Najiahu Mosque is counted as one of the largest and oldest mosques in Ningxia, although it was severely damaged during the Cultural Revolution Era (1966 AD - (1976 AD). It has a typical courtyard with a gatehouse, a large prayer hall, wing-rooms and bathrooms. The spacious hall can hold one thousand people. 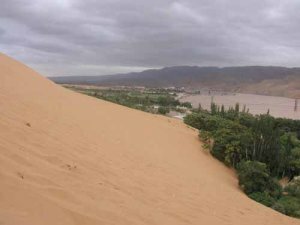 Certainly not a new but an increasingly popular attraction within Ningxia is the Sand Lake ((沙湖), an area said by some to surpass the wonders of Scenic Zone at Shapotou. Where the Shapotou Scenic Zone has become somewhat of a Tourist Circus where one can catch rides on Camels, play in the Dunes or cable across the Yellow River, Sand Lake is different because it is known as one of the best places for bird watching in all of China. To be exact, accoring to sources the Sha Hu Lake area of Ningxia is home to 198 species and over one million birds. Every year during spring and autumn, over one million migratory birds stop at Sand Lake, a crucial oasis in an otherwise endless and barren desert. Bird species nesting at Sha Hu include China's beautiful and often depicted white cranes, black cranes and red-crowned cranes, and also black storks, swans, wild geese and ducks and mandarin ducks. Apart from this, the Lake Area is also renowned for its abundance in fish and the variety of their species. In Ningxia's Sha Hu one finds not just the common carp, silver carp, grass carp and crucian carp but also the blunt-snout bream, which is rarely found in North China. Sha Hu today is also one of the rare places to find giant salamanders, a species especially sensitive to pollutants. Sha Hu (Sand Lake) Scenic Zone measures more than 80 square kilometers (about 31 square miles) in surface area which included 45 square kilometers (about 17 square miles) of lakes and over 22 square kilometers (about 8 square miles) of sandy deserts. Main attraction are the various migratory birds and other wildlife. Visitors can ride the motorboats on the Lake to enjoy Ningxia's azure blue sky and the scenery of green lake water, the yellow sand dunes of the Tengger Desert and the abundance of green and wildlife that is supported by it. Other activities on offer: water-motorcycling, wind surfing, and playing in- and sliding down- the dunes. Naturally, there is always the Bactrian Camel Ride. To find Sha Hu ((沙湖,Shā Hú), head out of Yinchuan in a northern direction some 56 kilometers (about 35 miles) to Pingluo County to find several entrances to the Lake and attractions. Equally popular as Helan Shan and more visited is the mysterious site of the 108 dagoba's found near Xintongxia, which is the western District of Wuzhong City Prefecture. Drive out some twenty kilometers south of the city of Qingtongxia while remaining on the western bank of Qingtong Gorge and the Yellow River to find Yibailingba Ta, holy site. Here at some 76 to 83 kilometers south-southwest of the city of Yinchuan, stands a large collection of ancient stupa's of which the origins are vague and unknown. These Stupa's, locally known as the "Baiba (108) Pagodas," are believed to originate from the Yuan Dynasty Era (1279 AD - 1368 AD), however historical accounts written in the Ming Dynasty (1368 AD - 1644 AD) contradict this and refer to the 108 Stupa's as 'Ancient' which suggests they date back to a much earlier Time. Whatever their history, the Stupa's are arranged in a peculiar triangular formation on an incline forming a unique constellation among silk road Monuments. Clearly, the triangular arrangement of stupa's in 9 layers which narrow towards the top, refers to the Spiritual Layers of Nirvana (Buddhist Heaven or a State of Complete Supreme Enlightenment). Mentioned here last, but certainly not least are important are ethnic cultures found within the Ningxia Hui Autonomous Region. Partly descended from Arab and Iranian traders and soldiers who settled in Chinese Territories from the Tang Dynasty Era (618 AD - 907 AD) onwards, the Hui have adopted many cultural traits of the Han including language however they have retained a distinct culture based around Islam which is refelected in their dress code and daily life's. Apart from the pre-dominant Hui, a mixed Islamic Group of which members can be found in just about any Chinese Province, several other smaller but distinct cultures inhabit this part of the Yellow River Basin. Read more about the Hui Islamic Minority or Hui Hui People （回族) in their very own section in the Cultural Section of China Report, or read: "History of Islam in China". The Liupan Mountain is covered with pine forests providing an important high altitude habitat for wildlife as well as the scenic area of the Liupan (六盘山) or Six Plate Shaped Mountain (also known as Longshan (六盘山脉)) Mountain. The Mountain is so steep that the path to its 2928 meter high top leads around the mountain 6 Times, giving it the resemblance of 6 plates stacked atop the mountain. The Luipan State Forest is even larger than the Mountain itself, encompassing 679,000 square kilometers of forested peaks, ridges, and ravines. Only a few years later the so-called 'Children of Huangshi' (or 'Children of the Inn of the 6Th Happiness') made it from Huangshipu (Fengxian) across the 2900 meter high snow-bound Liu Pan Shan mountains of Foot on a grueling three-month journey that would eventually lead to safety at Shandan, near Zhangye in Gansu Province on the edge of the Mongolian desert. Due to renewed interest in the story after the release of the Film: 'Children of Huangshi' starring Chow-Yun Fat, Liupan Shan has become somewhat of a Pilgrimage destination for those interested in the Life of George Hogg and his journey with the Children of the Bailie School. Apart from its natural beauty, impressive steepness and legacy as a natural boundary between very distinct parts of China, the Liupan Mountain is first and foremost famous in History due to the unique and unresolved legend attached to it. According to locals, including historians of the Guyuan County Museum, in the last days of his Life, Genghis Khan was brought to this mountain in the hope of reviving his health. Advertisement for Xixia Wanling World Cultural Heritage in a field near Yinchuan, Ningxia Hui AR. 1,000 cliff carvings created by various primitive nomadic peoples, some of which are thought to be nearly 4,000 years old and dated to the Shang Dynasty (1766 BC - 1121 BC) and Zhou Dynasty (1121 BC - 255 BC ). 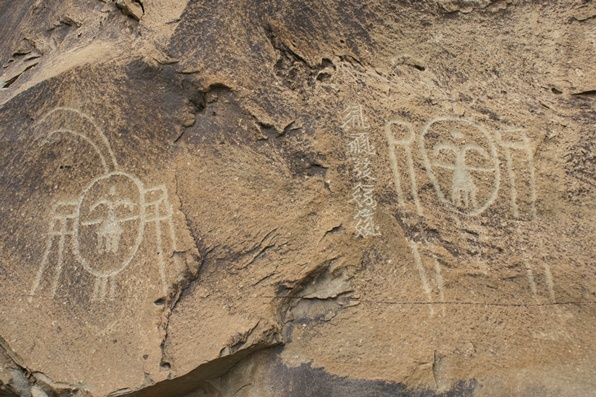 Some examples of the many primitive rock carvings and markings that are found throughout the Helan Shan Range. hundred kilometers, on both sides of a 600-meter-long ravine on the eastern slope of Helan Mountain. The Top of Helan Shan can be reached by Cable Car for a breathtaking view across the Yellow River Flow-plain or in the other directions, away into nothing. Another almost 'must see'-site, especially for those interested in the Islamic Culture and the Hui Nationality within Ningxia Region, is the Tongxin Mosque. Although not as easy to travel to as the Capital of the Region at Yinchuan, the trip to remote Tongxin may certainly be worth your while. The reason for this is quite simple: the Tongxin Mosque is the only surviving ancient Mosque within Ningxia. Of a land that was once known for its '1000 Mosques', only one survived unscathed through the turmoil and vandalism of the great 'Cultural Revolution', the largest upheaval in an long string of Revolutions declared and sought by the leading Communist Party. This Mosque is the Tongxin Mosque. The main reason it still stands today is that it played an important role during the last stages of the so-called 'Long March' and during the establishment of the earliest Communist Base in the area, a base that would later grow to include all of China (except Taiwan Island). The Tongxin Great Mosque, located in the rural town of Tongxin, the administrative Capital of Tongxin County of Wuzhong City, is the oldest and most famous Mosque in the southern mountainous area in Ningxia. The original mosque was established was founded during the 14th century at the end of the rule of the Mongol Yuan Dynasty (1271 AD - 1368 AD) or in the very the beginning of the succeeding Ming Dynasty (1368 AD - 1644 AD). The current Mosque dates from the year 1573 AD, when it was completely rebuilt during the reign of the Wanli Emperor (1572 AD - 1620 AD) of the Ming Dynasty. It was rebuilt not much later, about fifty years, under the rule of the newly arriving Qing Dynasty (1644 AD - 1911 AD). Most of the Mosque architecture and structures are preserved from that Era, although according to inscriptions on the tablets, the mosque experienced two large-scale renovations, one in the year 1791 AD and another in 1907 AD just before the fall of the Qing Dynasty. Among enthusiast of early Chinese Islamic Architecture it is said that the Tongxin Mosque is akin to early coastal mosques in its synthesis of traditional Chinese and imported Islamic styles, in spite of its inland location and later date. The term coastal Mosques refers to those Mosques created by the first generations of Islamic Traders who reached China via the emerging Maritime Silk Road (See: 'History of Islam in China'). All the buildings are built on a cyan platform of seven meters high. In front of the gate there is an imitated-timberwork entrance wall decorated with brick carvings. Visitors can climb to the pedestal of several meters high via an arch and a hidden passageway. On the pedestal, the first building you see is a two-storeyed minbar. Passing through the door beside the minaret, visitors can enter the courtyard that is composed of the main worship hall and the southern and northern sermon halls. The main worship hall consists of two connected halls, and can seat more than 1,000 worshipers. Apart from its exquisite and rare architecture, and its pivotal function within the Ningxia Hui Community, the Mosque is famous for several other reasons. First of all, as mentioned, the Tongxin Mosque is famous from the Long March and international press stories about the Communist Forces in the 1930's. It was described by Edgar Snow, a famous American journalist of the Chinese Revolutionary years, in his most famous book 'Red Star over China'. Not much later In October 1936, the Tongxin Mosque became the site of the establishment of the first Autonomous Hui Community, in which the Hui held their own special political rights. This Autonomous Community was known as the Yuwang Hui Autonomous Government - the first autonomous county in all of Communist China, long before the establishment of The Peoples Republic (1949 AD). Although this autonomous unit was short-lived, the mosque building was protected as a revolutionary historical site, and became the only major Islamic building in Ningxia to survive destruction during the Cultural Revolution. Secondly, not much advertized however of tremendous historical importance in relation to the Mosque is the fact that the Tongxin Mosque was built in located in the hills above the old city, overlooking the Town of Tongxin, which at the time was the largest settlement in this area just south of the Great Wall. The Mosque was built as a monument to the extension of the Great Wall of China to this point which was done by the predecessor of the Wanli Emperor (Reign Shenzong: 19 July 1572 – 18 August 1620) of the Ming Dynasty (1368 AD - 1644 AD). After visiting the Mosque it is possible to go out to the Great Wall of China nearby and see for yourself. The third and last reason for the fame of the Tongxin Mosque, one of the main reasons for the Hui, is that many famous Chinese Islamic Scholars studied and preached at this particular Mosque. Location of the Tongxin Mosque within Ningxia Province (Green). "From Vagabond to Journalist - Edgar Snow in China 1928 - 1941"
After leaving the Loess Plateaux of Gansu Province behind the Yellow River meets the sands of the Gobi Desert at Shapotou. Set in the foothills of the Helan Shan mountain range, outside and away from the main town of Dawukou in northern Shizuishan Prefecture, the Wudang Monastery is a rare and active Buddhist Monastery in an otherwise predominantly Hui Islamic region. The Monastery is but half an hours hike away from the short Jiucaigou Great Wall of China.